The name of this ancient Indian folk art form is a giveaway. 'Kalam' in Hindustani means 'pen', and 'kari' means handiwork. A kalamkari painting is a work of art that emerges from the rudimentary pens of local artisans, which are but sticks fashioned from the stem of bamboo or date palm and appended with a bunch of fine hair. An artistic produce of the southern recesses of the subcontinent, the colours infused in kalamkari paintings come from vegetable-based pigments mixed with mineral salts that function as mordants for the dye. The resulting works of art are what you see curated here in this one-of-a-kind collection - strong bold lines, rich solid pastels from a finite but statement colour palette, and themes that convey the devotion in the rustic heart of the Indian folk artist. While rudimentary implements and natural-derived dyes have been the stuff of folk paintings across the subcontinent since ancient times, each region has evolved to have its own distinctive style such that one form is distinguishable from the other at a glance. 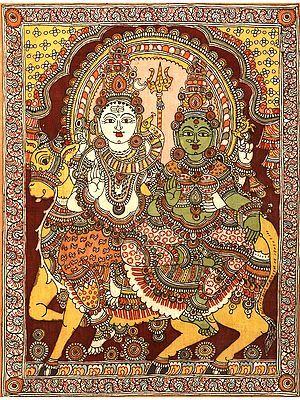 The Kalamkari tradition flourished in the temple regions of Masulipatnam, Kalahasti, and Thanjavur. This lends to themes that draw from Hindu mythology and constitute illustrations for the epics. The traditionally preferred canvas for kalamkari paintings have been cotton fabric, what with the gold-brocaded variations of this art having clothed royalty in the times of Raja Sarfoji and Raja Shivaji. The ones in this collection are in that sense authentic. The Mahabharata in the tribal and Folk Traditions of India.